Author Chat with James Riley (The Revenge Of Magic), Plus Giveaway! Today we're excited to chat with James Riley author of The Revenge Of Magic. Read on for more about James, an interview, plus an giveaway! JAMES RILEY lives in Virginia. He is the author of Half Upon a Time, Twice Upon a Time, and Once Upon the End as well as the Story Thieves series. Visit him online at james-riley-author.tumblr.com [james-riley-author.tumblr.com] or on Twitter @_JamesRiley_. Meet The Revenge Of Magic! 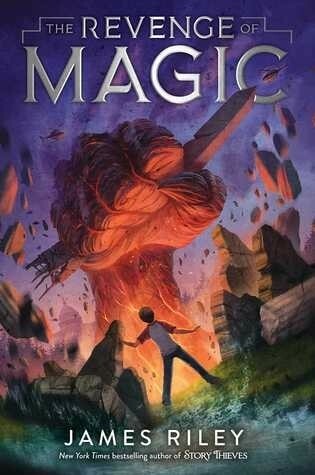 I’ve got a feeling that every fantasy writer has a “School for Magic” book in them, but I wanted to explore what the real world would be like if magic suddenly returned, and only kids could use it. In REVENGE OF MAGIC, the government runs the school, with the military on hand to guard the kids ... or to keep the kids from escaping. That leads to all kinds of fun questions for me, like what would the government and military get out of running a school for magic? How would the kids be treated? And what could be so dangerous a threat that the school would need to exist in the first place? YABC: Who is your favorite character in the book? I have a few favorites, which is always how it works. The most fun to write is Cyrus, a boy from the UK who knows Time magic and can see the future, so therefore has a pretty unique way of looking at things. Fort, the hero of the series, has to work twice as hard as the other students just because he wasn’t born on the day magic returned to the world, so it’s been satisfying to write a character who isn’t just the chosen one, and therefore has power handed to him. And then there’s Sierra … who I can’t say much about without spoiling the first book! Oh, it’s always the novel for me. I’m terrible at titles! For my series STORY THIEVES, I think I sent my editor around 11 pages of possible titles. THE REVENGE OF MAGIC wasn’t that bad, actually, in comparison. It’s just because we want titles to be perfect, to entice every single reader who barely glances at the title, to make them have to read the book. So no pressure. REVENGE OF MAGIC has some of my most emotional work out of all my writing so far, and whenever you try something new, or move out of your comfort zone (which would be cynical, snarky comedy for me), it’s easy to be nervous about what people will think. So I’m most proud of how people are caring about Fort and his father after a tragedy occurs in the first few chapters, especially since it’s what the first few books revolve around. It’d have to be to lighten up on myself. It’s hard to write a book, and a thousand times worse when your anxieties are weighing you down, questioning your every sentence. When I visit schools now and speak to kids about writing, one of the things I repeat over and over to them is that first drafts are allowed to be terrible, and that you can just let yourself write badly, because you’ll be able to make it better by revising and editing. It’s something I still have to remind myself on every new book. Living in Washington, D.C., it was uniquely fun to have a giant monster come in and destroy our beloved landmarks, like I was writing a big summer movie. So to see one of my monsters holding the broken Washington Monument up before our hero was pretty amazing. Vivienne To, my cover artist, always just knocks it out of the park, and she literally destroyed it on this cover! More REVENGE OF MAGIC! One of the great things about this series for readers is that they’ll be coming out every six months, which is good, because I have some pretty terrible cliffhangers coming up. So that means I’ve got to write these pretty quickly! I’m working on book three right now, for a total of seven. Author Chat with Erik Daniel Shein (Thunder: An Elephant's Journey) Plus Giveaway! Author Chat with Hannah Jayne (The Revenge), Plus Giveaway!